Recipes: 'The Herbal Kitchen' Jerry Traunfeld is the chef at Herbfarm restaurant outside Seattle. Not surprisingly, he thinks the secret to transforming the ordinary to the extraordinary is fresh herbs. 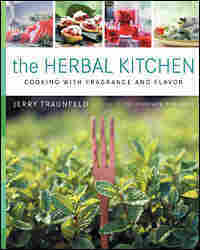 His The Herbal Kitchen comes recommended by Bonny Wolf in her summer roundup of cookbooks. Jerry Traunfeld is the chef at Herbfarm restaurant outside Seattle. Not surprisingly, he thinks the secret to transforming the ordinary to the extraordinary is fresh herbs. 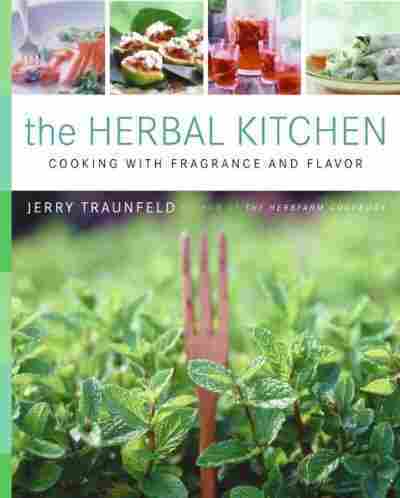 His The Herbal Kitchen comes recommended by Bonny Wolf in her summer roundup of cookbooks. Get more cookbook picks from food writer Bonny Wolf. Pull off the small white piece of muscle that is attached to the side of the scallops (some might not have it). Pat them dry on paper towels and season them lightly with salt. Heat the olive oil in a large heavy-bottomed skillet over high heat. When the pan is very hot, use tongs to lower in each scallop, flat side down. Cook, without shaking or moving the scallops, until the undersides are a deep brown color. Flip them and brown the other side (if they stick, loosen them with the edge of a sharp metal spatula). Put the scallops on a warm platter or plate and cover loosely with foil while you prepare the succotash in the same skillet. Lower the heat to medium, add the onion and bell pepper to the pan, and stir them around until they soften, 2 to 3 minutes. Stir in the corn, beans, wine or vermouth, water and 1 teaspoon salt. Cook, stirring from time to time, until about half of the liquid boils away and the vegetables are nearly cooked through. Add the cucumber and cook another minute to heat it through. Stir in the butter until it melts, then the cilantro and basil. Tip any juices that collected under the scallops into the succotash. Taste the succotash and add pepper and more salt if you think it’s needed. Spoon the succotash onto warmed dinner plates. Arrange the scallops over the top and serve right away. Bring the sugar, water, and cinnamon to a boil in a small saucepan. Reduce the heat and simmer the syrup for 3 minutes. Stir in the basil leaves and remove from the heat. Let the syrup cool to room temperature. Strain, and stir in the lemon juice. Toss the watermelon and blueberries together in a large bowl. Pour in the syrup and sprinkle with the small leaves or strips of basil. Toss again and chill for at least 1 hour. The melon will release juice and thin the syrup. Spoon the fruit and syrup into glasses or bowls and serve cold. Excerpted from The Herbal Kitchen by Jerry Traunfeld. Copyright © 2005, Jerry Traunfeld. Reprinted by permission of Morrow Cookbooks, a division of Harper Collins Publishers, Inc. All rights reserved.